The small footprint fits many Harley Davidson motorbikes as well as jet skis but also ideal for race and track day cars up to 2.0 litre where weight saving is at a premium over a/h capacity. 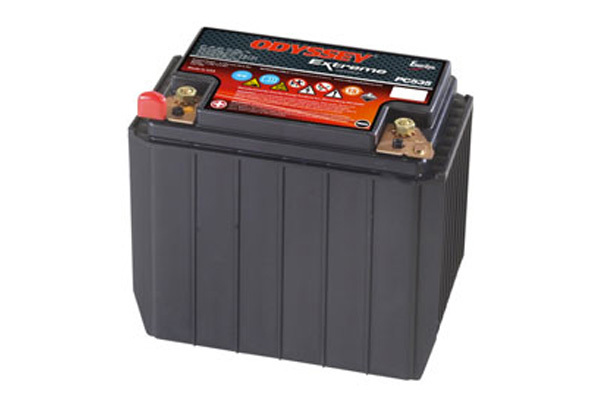 ODYSSEY PC535 Pure Lead Maintenance free Drycell battery featuring TPT (thin plate technology) which was originally developed for military aircraft requiring very high power delivery for short durations. Exceptionally good anti-vibration properties with fast recharge capability and recovery from heavy discharge. Can be mounted upright or flat. Design life of 8-10 years. With a small footprint will fit many Harley Davidson Motorbikes as well as Jet Skis. Also ideal for race and trackday cars up to 2.0 litre where weight saving is at a premium over a/h capacity.